The fourth in a new series of classic detective stories from the vaults of HarperCollins involves a tragic accident during a shooting party. As the story switches between Paris and Hampshire, the possibility of it not being an accident seems to grow more likely. "The Detective Story Club", launched by Collins in 1929, was a clearing house for the best and most ingenious crime stories of the age, chosen by a select committee of experts. Now, almost 90 years later, these books are the classics of the Golden Age, republished at last with the same popular cover designs that appealed to their original readers. "Mr Arnold Bennett, in a recent article, criticised the ad hoc characterisation and human interest in the detective novels of to-day. 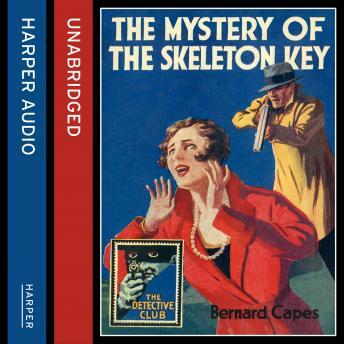 "The Mystery of the Skeleton Key" contains, in addition to a clever crime problem and plenty of thrills, a sensible love story, humour, excellent characterisation and strong human interest. The scenes are laid in Paris and Hampshire. The story deals with a crime committed in the grounds of a country house and the subsequent efforts of a clever young detective the track down the perpetrator. The Selection Committee of "The Detective Story Club" have no hesitation in recommending this splendid thriller as one which will satisfy the most exacting reader of detective fiction."